PERFECT CHEMISTRY: Carmel, James and Bridget Delahunty are continuing the name which has become synonymous with healthy living in Brisbane. James born to dispense good advice. By the tender age of 14, James Jnr knew he was destined to join the family firm. He started out modestly by delivering medicines and washing bottles. (Those were days when medicines were mixed at the pharmacy and decanted into bottles. A dumb waiter pulley system lowered them from the upstairs dispensary to the ground floor.) It was an early initiation, but the young James loved it. In 1966 he completed his Bachelor of Pharmacy at the University of Queensland, and took the pharmaceutical oath at the age of 21. After traineeships at the Mater Public Hospital Pharmacy Henry Evans Chemist in Roma St and a three-month contract as a locum in New Guinea, his father Jas employed him as a pharmacist. Jas was a partner in the T&G Day & Night Pharmacy and it was Jas was a partner in the T&G Day & Night Pharmacy and it was while working there that James Jnr met his future wife, pharmacist Carmel, at a staff Christmas party where, the story goes, he impressed her with his dancing skills. The couple married in 1978 and have four children – Daniel, Brendan, Bridget and Seamus – all of whom are university educated and have entered the business worlds of commerce, real estate, and pharmacy in Bridget’s case, giving the family three generations of pharmacists and future succession planning. James Jnr is presently on the Advisory Board of Pharmacy at QUT and a Member of the Australian College of Natural Medicine Council. He is also a Member of the Pharmaceutical Association and the Pharmacy Guild, and a Fellow of the Australian College of Pharmacy Practice Management and of the Australian Institute of Company Directors. Good service no doubt makes a business, but also contributing to the success is James’s own glowing reputation. He is well-known as a professional businessman and community-minded resident and has friends from many walks of life. Following in Dads Footsteps: Family Ties: Bridget Delahunty with dad James Jnr. Bridget Delahunty didn’t need to visit her high school guidance counsellor for help on choosing a career path. It was written in history that she’d become a pharmacist. Fifteen years ago, an eight-year-old Bridget was amid the family business’ 60th anniversary celebrations, and a newspaper reported on it, stating "Future pharmacist” below Ms Delahunty’s photo. At 22, she completed stage one of her journey to becoming a third-generation pharmacist, by completing a Bachelor of Pharmacy at University of Queensland. Ms Delahunty said there was no pressure to pull on a white lab coat. "I chose pharmacy because I really enjoyed caring for our clients at mum and dad’s chemists, as well as keeping people healthy and providing remedies to help them through their illnesses,” she said. She is now manager of Delahunty's MacArthur Central Chemist located in Brisbane city. History of a fascinating dynasty. But on James Delahunty’s side is his own reputation. The owner of Delahunty pharmacies is well-known as a professional businessman and community minded resident. He has friends in many places ranging from real estate proprietors to Chief Justice Paul de Jersey. Long time friend Tony Atkinson, managing director of Raine and Horne Queensland said from the early days when they were at school James was always involved with the community. " We go back 60 years. His parents used to own the Grosvenor and two pharmacies,” he said. One of Delahunty’s customers is Wal Bishop, the owner of Wallace Bishop Jewellers. They have been fellow retailers in the CBD for 20 years. Mr Bishop said Mr Delahunty was known for being fair. " He’s very enthusiastic. Anything he touches goes well,” he said. Pharmacy Guild of Australia president Kos Sclavos said the Delahuntys helped many pharmacists get a leg up in the industry. " 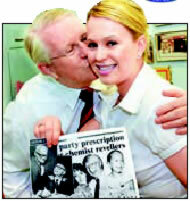 Many pharmacists do work experience or pre-registration (an internship) at Delahunty pharmacies,” he said. " James and his wife Carmel always support the industry. " Carmel is also a role model to other women in the pharmacy game.” It seems it’s a case of like father, like son. Leaf through the family photo album and you’ll find yellowing pictures of Jas J Snr, pictured with the likes of Sir Raphael Cilento, Sr Henry Able Smith, and Vince Gair.